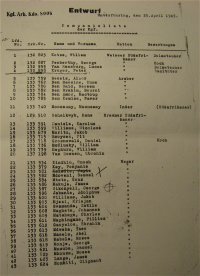 I am trying to trace down my father's whereabouts during WW2. We used to have discussions around the war as I am very interested in the history of the war. He used to tell me that he was a pilot and flew in Egypt and Italy. Unfortunately he passed away in 1990 but his memory always lived on in me. Features Height - 5ft 5in. Eyes - Green-brown. Hair - Light brown. 1 scar left thigh. 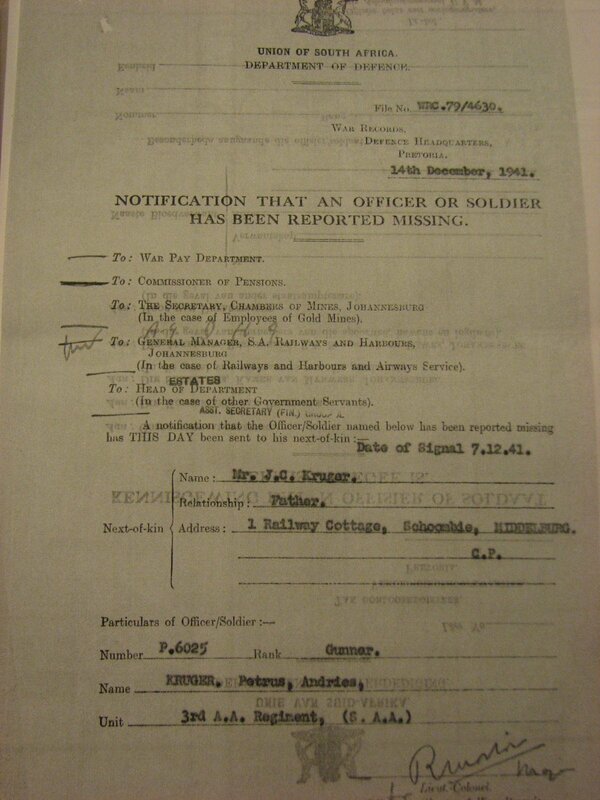 Notification - Missing File no WRC.79/4630 14 December 1941 date of signal 07/12/1941. unit 3rd A.A. Regiment S.A.A. Till recently I was convinced he was a pilot although some stories he told me did not really make sense. He told me that he was downed over the Mediterranean Sea and was only rescued some days later. This was his excuse why he had a hate for swimming in the sea. He also used to be very much to himself, alone with not many friends. Towards the end of last year I tried to trace down his war record. To my amazement I had to find out that he was actually a gunner for the 1st Anti Aircraft Brigade South Africa. This I must add, I was not ashamed at the stories he told, I was more proud of him. To be a POW for 4 years and come back takes some doing and is proof of a man with character. 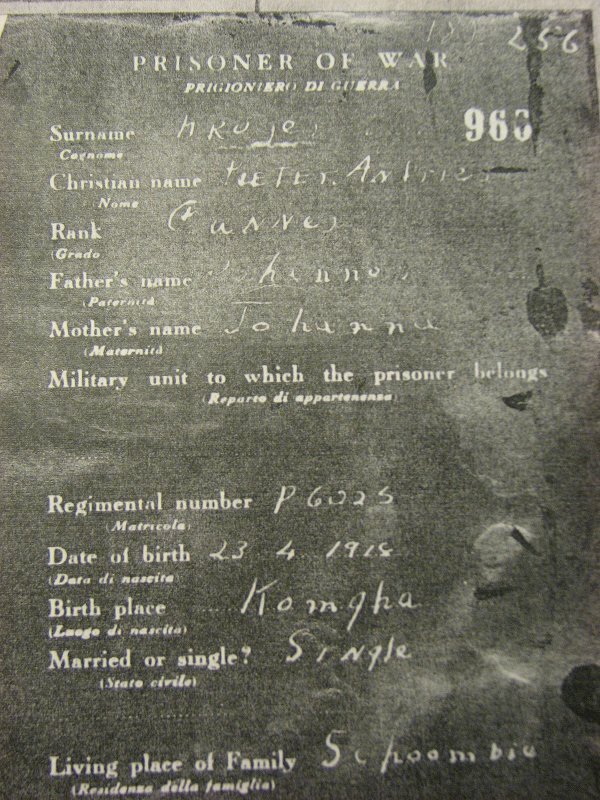 According to his record he started off in the service in 1938 as a gunner for the South African Artillery. 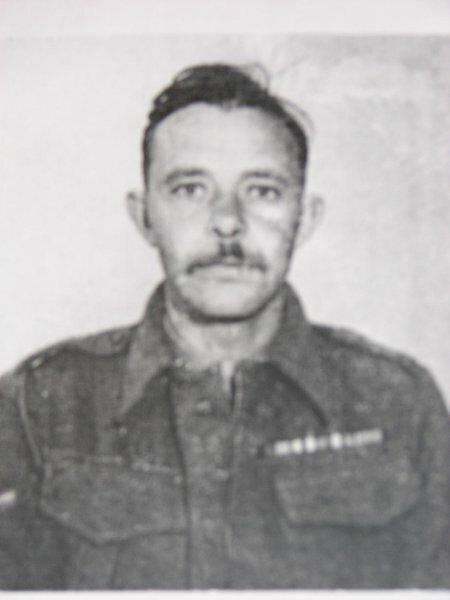 He was posted to the 1st Artillery Battery in June 1938. In April 1940 he was posted to 2nd Artillery Battery. 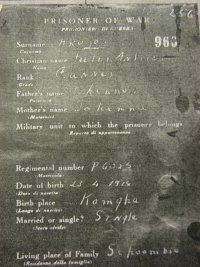 In June 1940 he disembarked in Mombasa. In December 1940 he was posted to 1st Anti Aircraft Brigade SAF MFF UDF. In April 1941 he embarked at Mombasa for Port Said on the ship “Niew Zeeland” where he arrived May 1941. From here I do not have much only that he was captured on the 23 November 1941 with the battle of Sidi Rezegh. Where and how he was captured is what really interests me. 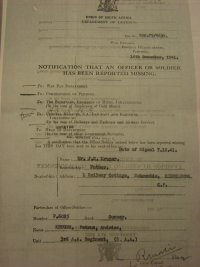 He was sent to Italy, could he have been on one of the ships that were torpedoed by the British? That will fit into the sea experience he had. There is mention of two camps in his record Camp 66 and Camp 52. He was also wounded in Italy while being a POW. What happened? From Italy he went to Germany. It is suspect he was in Stalag VII A but I do not have confirmation of that. 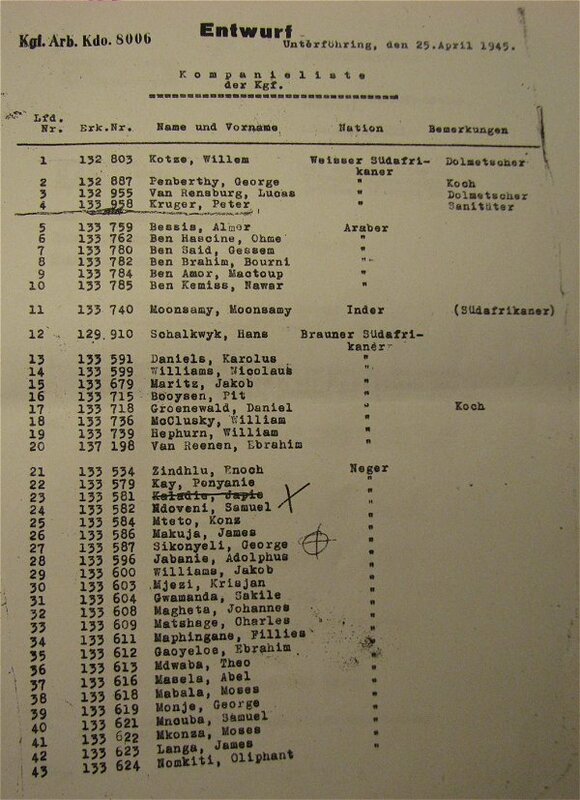 What I do have is a company list from an Unterföhring work kommando listing where his name appears as a medic. I can not get confirmation as to where the POW was sent to work. After his release in 1945 he was involved in an incident where he had to shoot a fellow South African in self defense. There were witnesses to the incident and I could not get much from his service records. Last update 2 Aug 2007 by © Team Moosburg Online - All rights reserved!